Click the button below to add the Guy Harvey Island Marlin Men's Back-Print Tee w/ Pocket in Hot Pink, Orange, Navy Blue, Denim Blue or White to your wish list. 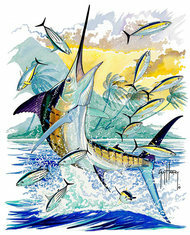 Guy Harvey Island Marlin Back-Printed 100% Cotton Tee with Front Pocket and Guy Harvey Signature - Design Features a Blue Marlin Knocking a School of Yellowfin and Skipjack Tuna Skyward with Island and Palm Tree Backdrop White Shirt Now Available in 4XL! The sizes were not consistent. We ordered a Mens Medium yellow shirt and a Mens Medium Blue Shirt. The yellow was a typical men's medium but the blue was a lot smaller. It looked like a womens medium or boys.. I actually bought this shirt for my son. But it looks great on him! I intend to buy more soon for my husband! Nice but not the colors I wanted. 3 LX size shirts in the fun sizes. My husband likes red and maroon and you were out of the shirts he liked that came in that size too.